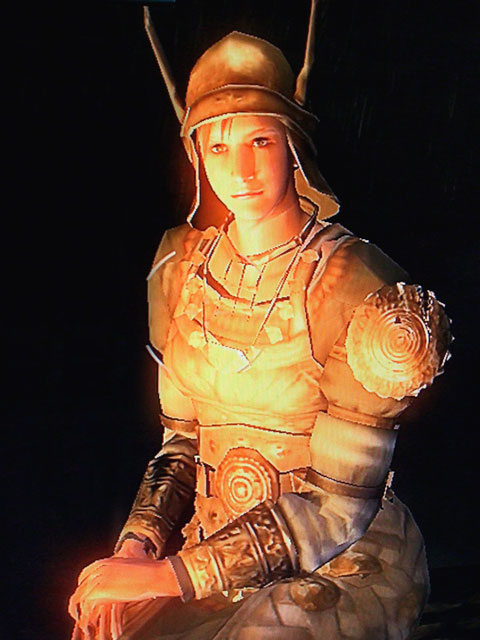 Selen Vinland is a NPC in Demon's Souls. Selen Vinland is sister to Garl Vinland, Maiden Astraea’s bodyguard. She ventured into the Valley of Defilement in hopes of finding her brother, but has taken refuge in the swamps unable to discover his whereabouts. It is from her that the player learns of the Valley’s wretched past of being a dumping ground for aborted children. Defeat Black Phantom Garl Vinland (Pure White World Tendency in Dirty Colossus Archstone, and he will drop the Crest of Vinland. This is the proof of her brother she needs to see. Killing her in her body form will cause your Character Tendency and World Tendency to shift by -2. She will cast Heal and Anti Magic Field. If you choose to face her in melee, be aware she is using a Blind against you, so go two-handed with your weapon and try to finish the fight quickly. If you can, back her up against the fence or somewhere she cannot roll backwards to heal. It won't be hard to interrupt her actions and kill her. By using the poison swamp to your advantage, allow your HP to fall below 30% and equip the Clever Rat's Ring and/or the Morion Blade. Equip a weapon with a solid stunlock and the ability to be Enchanted. Possible weapons include the Blueblood Sword, due to the high magic damage and moderate stamina usage per swing. Alternatively, the Meat Cleaver, for its stun immunity during its swing animation, although you are limited to 3 R1 swings maximum. Ensure you two hand your weapon of choice and approach Selen as quickly as possible to avoid detection (Graverobber's Ring may help). Get close to her land patch, while also conserving stamina to ensure you can stunlock her as long as possible if she suddenly attacks. Under these conditions, Selen should be killed by the end of your combo. If she survives, use the push attack if using a Blueblood Sword which should keep her stunned long enough to recover and attack again. If you are using the Meat Cleaver, simply approach her as she stands up and lock her in a combo again. If you are concerned that you may take a hit before you are able to stunlock, try Warding; if not stick with Second Chance. Equip a sword with a large knockback like the Dragon Bone Smasher and dual hand it. When she gets knocked back, run a few feet forward and R2 as she is getting up. This will not only do lots of damage but will not allow her to attack or heal. By the time the attack hits, she has just regained composure and will get knocked back again. Repeat until death. It is possible to kill her in less than 6 hits using this tactic. If you aren't doing NG+ another good tactic would be a hit and run. Equip a Thief's Ring and Graverobber's Ring, come from the backside and get in a back stab. When Selen is flying face first into the muck, turn and run for your life. She will either a) cast Anti-magic field, or b) trail behind you a while before giving up. Simply rinse and repeat and bring lots of Poison heals. Once her HP gets low, you should stand and fight to prevent her from healing. You can attack her from range with a bow and do good damage, but she will move around so you need to keep retargeting her. This can be done from the safety of the boardwalk up the cliff face. If you can tolerate standing in the swamp, through the fence from the other side of the fog door. Bring Morion Blade and the Clever Rat's Ring to speed things up. Fire Arrows and Rotten Arrows makes it easy to track her in the gloom. Once her HP get down below half, she will start to cast a Heal miracle. You need to be able to interrupt her or this fight will never end. Move close enough where you can lock onto Selen with R3. Throw some Soul Remains at her. She will start chopping at the air and ignore you. At this point, cast 3 or 4 fireballs. She will start moving toward you, but throw another Soul Remains. Again, she will chop the air and ignore you - while she is doing this, eat some Old Spice to fully recharge your magic meter or some grass if your health is getting too low. Repeat this process until she dies. This should interrupt her heal miracle and keep her from attacking with Blind. If she uses Anti Magic Field, simply move back and wait for it to wear off. As long as you keep throwing the Soul Remains, it will keep her distracted. If you want to be cheap you can sneak up behind her (use the Thief's Ring if necessary) and cast Poison Cloud and/or Death Cloud. Stand and wait until it runs out, then cast it again, and repeat. It should only take 3-4 casts. As long as you don't attack or move too close to her she won't attack or heal, but to be safe, try and stay in one spot. Make sure you stay on top of your health. Black Phantom Selen is very easy to kill from NG+ on… Simply equip your Thief's Ring to sneak behind her and hit her with Soulsucker for an instant kill. Why, you are one of the sane ones, are you not? I am Selen of the West. I seek my brother Garl Vinland, the knight who accompanied Saint Astraea on her travels. I believe they settled here. If you happen to see my younger brother, please tell me. I must share with him the last words of our father. I heard an unflattering rumour about Saint Astraea. Have you met that herb-peddling woman? She claims that Saint Astraea is herself a Demon. That woman has no reason to lie. Surely she must be mistaken. I find something odd about this place. It brims with grime, but at once feels strangely pure. This crest! That is a Vinland heirloom meant for my younger brother. The poor souls. Perhaps their hearts were too pure. O traveling warrior. I hesitate to ask, but can you part with that crest? Garl has strayed from the path of righteousness, but I wish to have the heirloom, in honour of our Vinland blood. I shall reward you in kind. Thank you, kind warrior. As Garl's sister, I express my deepest thanks for your honouring of his name. Please accept this. It was intended for my brother, but now it should belong to you. May the angels gaze favourably upon you. Yes, I see. But you must realise that an ordinary crest will bestow upon you no power. I only wished to remember my poor younger brother by it. Perhaps you can reconsider? Please accept this as thanks. Perhaps you will have use of it on your travels. Same response as answering 'Yes' the first time. Yes, I see. I can no further presume upon you. Perhaps this is punishment for Garl's wrongdoing. I will search for a way back home. May you be unharmed in battle, and safe along the roads of your travel. What in heavens name? I am no foe of yours. If you decide not give her the Crest, she will ask you to reconsider. If you do reconsider, you only get one Dark Moon Grass if your Faith is below 10, if your Faith is 10 or above you still get the Ring of Devout Prayer. Deny her again and you will not be able to complete this sidequest for the remainder of the current play-through. If she manages to cast Anti Magic Field, she will chase you down. Anti Magic Field is like her little magical beacon. Unlike Scirvir, she will not run out of MP. It doesn't matter how much you wait. Even if she shows the low MP animation.